Vitamin K pairs up with vitamin D, much like magnesium pairs up with calcium. Both vitamin K and magnesium help keep calcium in the bones and out of the blood vessels and other soft tissues. Whenever vitamin D and calcium are being taken by a consumer or prescribed by a practitioner, then vitamin K and magnesium should likewise be included in the daily regimen or protocol. 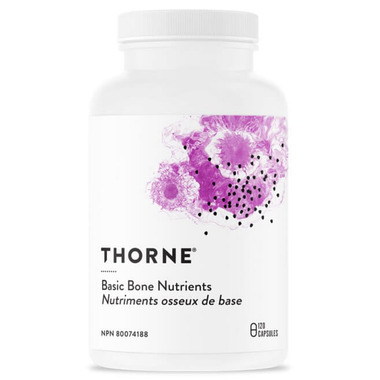 Thorne has chosen DiCalcium Malate and DiMagnesium Malate for Basic Bone Nutrients because these two forms of calcium and magnesium exhibit a combination of both optimal absorption and optimal concentration. MenaQ7 is soy-free and has been clinically studied and found to be effective for supporting bone health at levels as low as 45 mcg daily. Take 1 capsule two times daily or as recommended by your health professional. Take a few hours before or after taking other medications or natural health products. Take with food. Consult your health professional prior to use if you are taking blood thinners. Keep out of reach of children. Very good basic bone supplement, this particular one is difficult to find in Canada too. Malate forms are well absorbed but should be taken with meals as might be a little stomach irritating otherwise. Will buy again, thank you Well.ca for selling it.